Macronix, the electronics manufacturing company Nintendo has commissioned to produce the 3DS’s game cards, recently revealed the storage limits for the highest-capacity carts: a whopping 8GB. 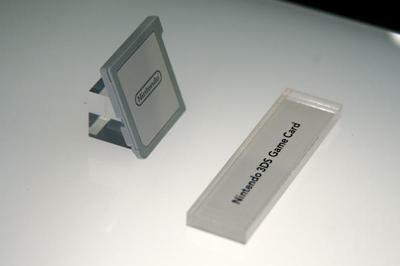 Consider that the original max size for the DS cart was only a diminutive 512MB, that the GameCube disc could hold 1.4GB, and that Wii optical discs range from 4.7GB for standard discs and 8.54GB for dual-layer discs. That means that the 3DS can handle games almost as large as the Wii’s – although of course the 3D rendering will take up a sizable chunk of the extra space. What does this mean for us? It means the divide between handheld and home console gaming has shrunk considerably, at least for the remainder of the current generation. We may see a brand-new grand-scale Zelda entry reach the 3DS sometime during its lifespan – one that can go far beyond the limits of earlier titles.